Back in november 2007, I had a few days of enthusiasm and took my bicycle to work (the car was in for repairs at the local sparepart pusher). A collegue told me of a shorter route, though some suburban areas and here I saw a familiar sight – that is, if you know your Werner Beinhart. A picture says more than words, so I shot a frame with my petty mobile. 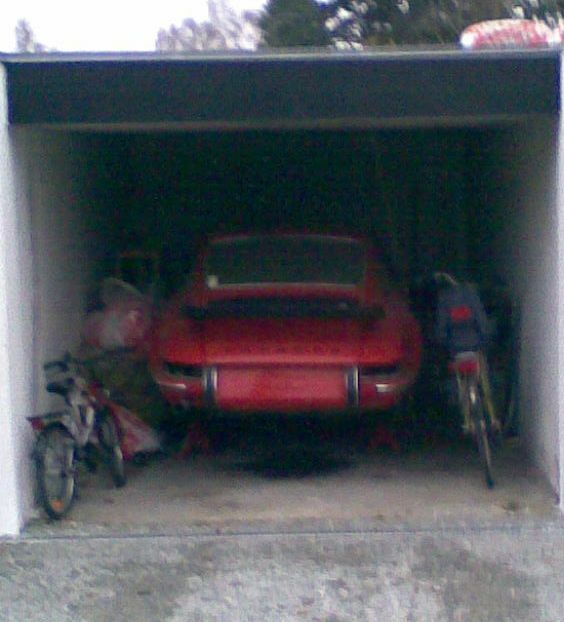 Sure looks as if Holgi has moved to the greater Copenhagen area and brought his Porsche with him. All down to the pool of oil beneath the engine . Holgis Red Porsche is pictured on the official Werner homepage, as it looked for the revanche at “Das Rennen 2004” – where Brösel once more was beaten by the Porsche 👿 . So, it anyone has a bunch of Horex engines lying around and a lot spare time, maybe we could make our own Red Porsche Killer and invite this suburban Red Porsche for a new “Das Rennen” . Update, 9/1 2009: The links in the original text has become broken. However, the danish tv channel, dk4, has a webpage dedicated to Werner, as part of a german language course. A video with the Porsche can be seen here. This entry was posted in Humor, In english, Motorcykler and tagged comics, holgi, red porsche killer, werner beinhart. Bookmark the permalink.